One preschooler stood tall this month, thanks to a stranger's kind donation that helped him take his very first steps. Add Be Inspired as an interest to stay up to date on the latest Be Inspired news, video, and analysis from ABC News. Luis Tamarez, 4, a student at North Main Street Elementary School in Pleasantville, New Jersey, took his steps this month using an Upsee mobility device and again today with his mom and stepdad watching. 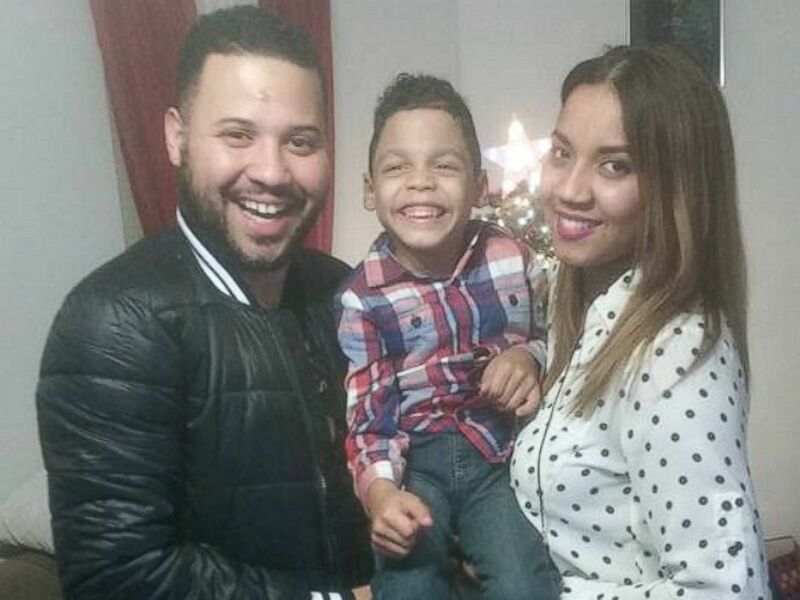 "I have no words to describe what I felt," Luis' stepfather, Argenis Borbon, told ABC News today. "It's phenomenal just by seeing my son's face. It's incredible. These people in the school, they've been so great to him. “He doesn't want to miss a day. Even on the weekends he wants to come back here and we are very grateful for that." Luis has cerebral palsy and uses a wheelchair to get around. His teacher, Amy Cutler, said Luis has an "incredible spirit" and is loved by his peers and educators alike. Cutler said she learned about the Upsee in December from a fellow teacher. It is a harness that attaches to another person and allows a child with motor impairment to stand upright and walk with assistance from that person. Cutler began researching crowdfunding pages to raise money for the $500 Upsee for Luis. Yorel Browne, a substitute teacher at North Main Street Elementary and former principal, was intrigued by Cutler's idea. Browne also works as an Uber driver and was chatting one day with a local businessman whom he was driving to Atlantic City. The two made small talk that led to a random act of kindness. In this undated photo with his mother, Esmarlin Nunez and step-father, Argenis Borbon, Luis Tamarez, 4, took his first steps at North Main Street Elementary School in Pleasantville, New Jersey on Jan. 5, using a mobility device called an Upsee. "I'm telling this story of how great this kid was ... who has a disability and is so enthused to help himself," Browne recalled. "He said, 'Wait a minute, you don't have to do a fundraiser, I will write a check to cover this device.' We brought the gentleman to the school. He wrote a check for $500." Jim Burke, 49, of Mays Landing, New Jersey, was the stranger riding in Browne's Uber that day. He is the owner of a local heating, ventilation and air conditioning company. Burke told said he donated the money for Luis' Upsee simply because he was in the "right place, at the right time." "It was a no-brainer. It touched me," he said. "It didn't even take a split second. It was a very easy decision." Burke was invited to the school Jan. 5 to witness Luis use his Upsee for the first time while attached to his one-on-one aid, Collins Days. "He was just overjoyed and smiling. … I remember him saying, 'I'm walking,’" Burke said. Luis' mother, Esmarlin Nunez, said she cannot thank Burke enough for his generosity toward her son. "It's something that doesn't have a price," she said. "I have no words to describe it."